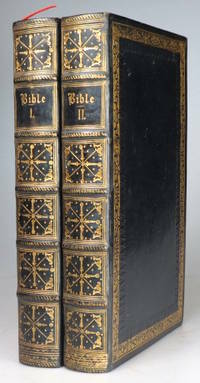 viaLibri ~ The Holy Bible, Containing the Old and New Testaments: Translated Out of the Original Tongues;.. The Holy Bible, Containing the Old and New Testaments: Translated Out of the Original Tongues;..
Edinburgh: Printed by T. Constable... for Cowan and Company, 1851.. Two volumes. 8vo. 624 and 625-1119, (101) pp. Contemporary dark blue full calf, spines with raised bands, gilt lettered direct to one panel and richly decorated with a cross motif to the other compartments, gilt scrolled boarders to the boards, all edges gilt, ownership inscription of a James Kirkpatrck of Kildrum, Co. Donegal dated 1859 to the front flyleaf of each volume. A handsome set. Although they are unsigned, the style of the bindings, the imprint of the books and the provenance suggest they might have been executed by an Irish or Scottish binder.